There have been (since the launch of the kit) a number of complaints relating to FM reception and RDS problems. I have built this kit 5 times now, and I have had 3 units (completed by other people) in for repairs. I have not (yet) had any complaints from the owners of the ones I have built: however, each one of the repair units I have looked at has had the same reported problem - poor FM reception but reasonable AM, plus loss of RDS TA/TP capability and poor tuning and lock. Having looked at the two most recent repair units the same construction problems were evident - the connection of the coax to the tuner board in the bottom of the unit was poor. When corrected, the units worked perfectly on my test rig, pulling in stations from quite a distance as well as national RDS FM stations. So, what's the source of this mysterious problem? 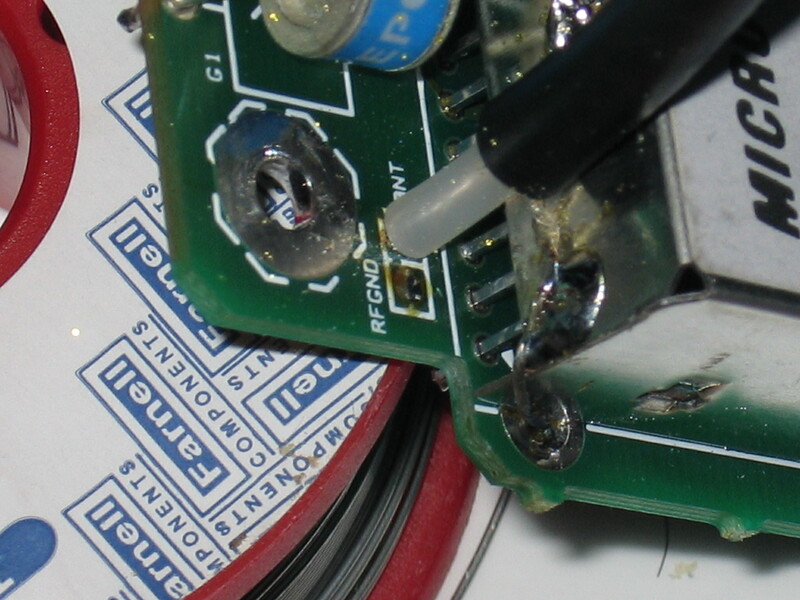 On the tuner PCB, the input signal solder pad on the PCB is adjacent to the grounding pad. There's only about 1mm between them: on the version of the kit with the multistrand core conductor, if there are any stray conductors from the core they can short the signal to the grounding pad. On the single strand core version, the cable can twist bringing the shield braid in contact with both earth and even the signal core. In both cases, the input signal is simply shorted out and the tuner board gets no input from the antenna. You can see that during construction, attention to detail when you are connecting the antenna lead to the board is very important. 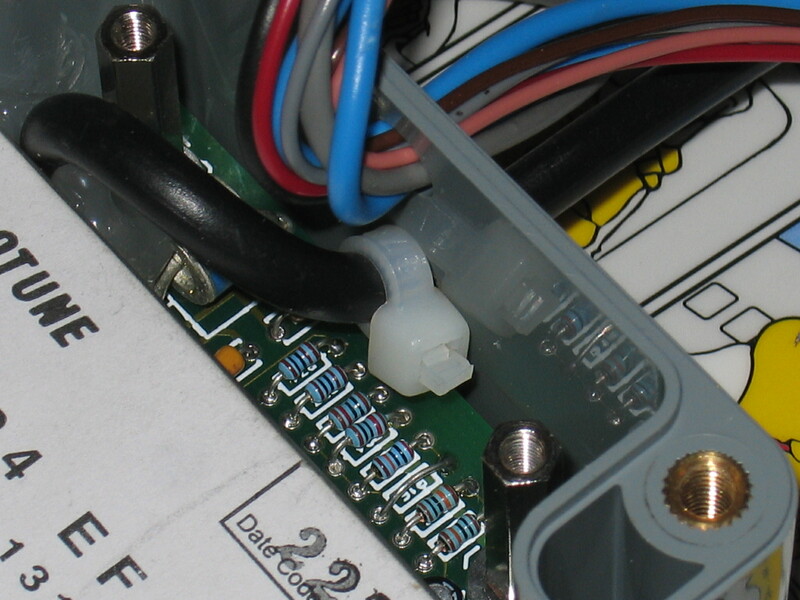 On the third repair unit, the single core conductor had snapped off at the PCB due to fatiguing. 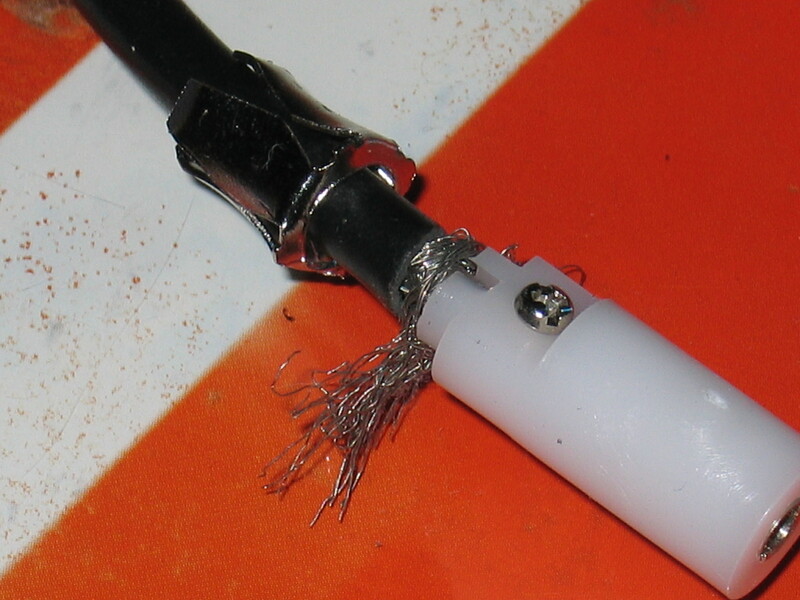 This was mainly due to the lack of stress relief - the cable ties supplied with the kit were not used and the core broke off as a result of twisting. I've come up with a slight modification to the build method of the tuner to stop this happening and hopefuly ensure good quality signal reception. Firstly, I would stress that these kits are pretty easy to build and are good value for money. However, you need to know what you are doing, have the right tools, and to be careful with your soldering - especially on the tuner board. Take the care to do it properly. I am inclined to say that the construction order (processor board then tuner) tends to leave the builder impatient to get it finished off quickly as you reach the second board (the tuner) meaning that attention to detail drops along with build quality - and hence the quality of the signal you will eventually receive. 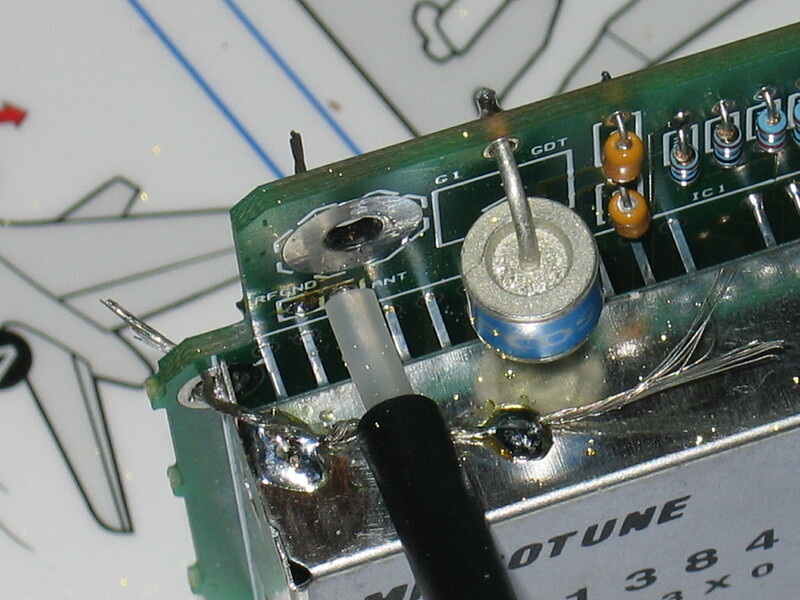 Follow these steps when you are attaching the coax cable to the tuner board. 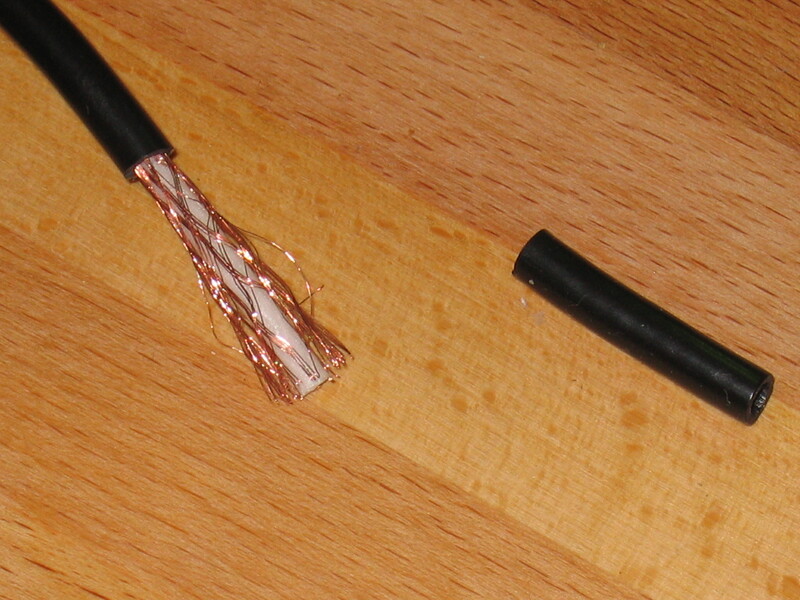 1) Begin with the coax cable. If you have the cable supplied with moulded on plug, cut the plug cleanly off the cable with clippers. Insert the cable (regardless of which type you have) through the lower drilled hole in the tuner box and feed it through to the inside sufficiently so you have a length of lead to work on easily..
2) Carefully strip the coax back 25mm. Trimmed coax I use a scalpel to do this (carefully, of course!). Be careful not to cut through the shield braid completely - if you do, you'll have to cut the cable back another 25mm and do it again. 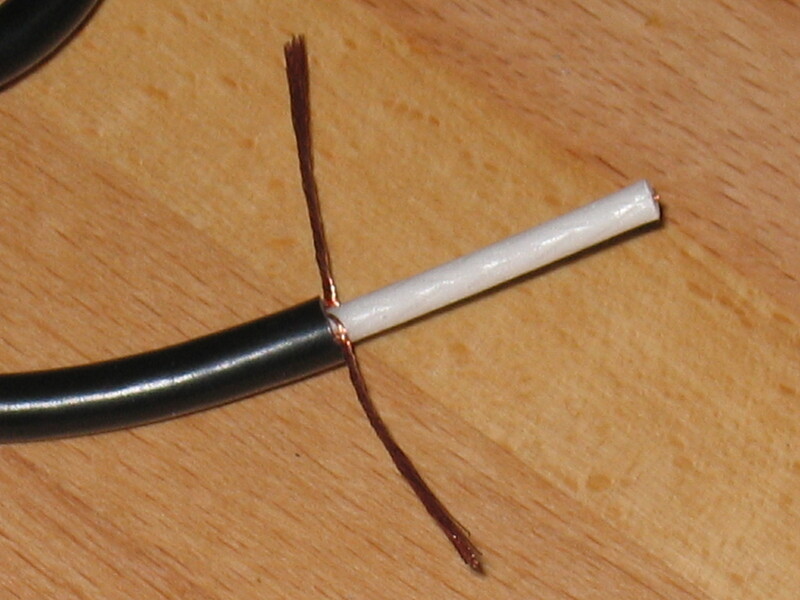 4) Cut the centre core back to 10mm length, then remove a further 5mm core insulation to expose the centre conductor. Trimmed core As before, be careful not to cut completely through the core. If you have the multi-strand core, twist the core into a single pigtail in the same way as the shield braid. Put the resulting cable to one side. 5) Locate the two holes in the Tuner PCB for signal input and signal shield. Fill in the shield hole with solder. Don't use too much, just a little. Wick off excess. 6) Dab a small blob of epoxy or hot glue over the sealed up hole. Don't put on a large amount: the idea is simply to obscure the contact pad. Be careful not to cover the signal input hole next to it. 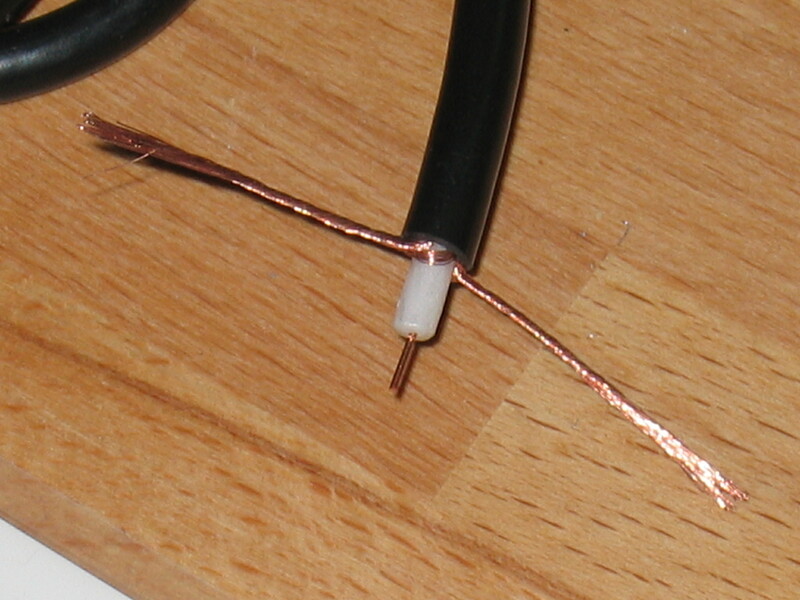 7) Insert the signal wire from the prepared coax into the solder hole, making sure that the insulator butts up at right angles to the circuit board. Solder the contact making sure that the insulator core remains tight against the board as you solder it. 8) Solder the two pigtails to the can of the tuner, and through the large PCB hole at the corner of the can nearest to the signal hole. Tip: Lay the cable flat against the can as you do this. Use only enough solder to hold the joints properly, and make sure that the joints are good (not "grey"). Use these two images as examples. 9) Make continuity checks with a multimeter to ensure that the signal conductor is not shorted to the earth shield, and vice versa. If there is a short, investigate the cause and rectify before proceeding. 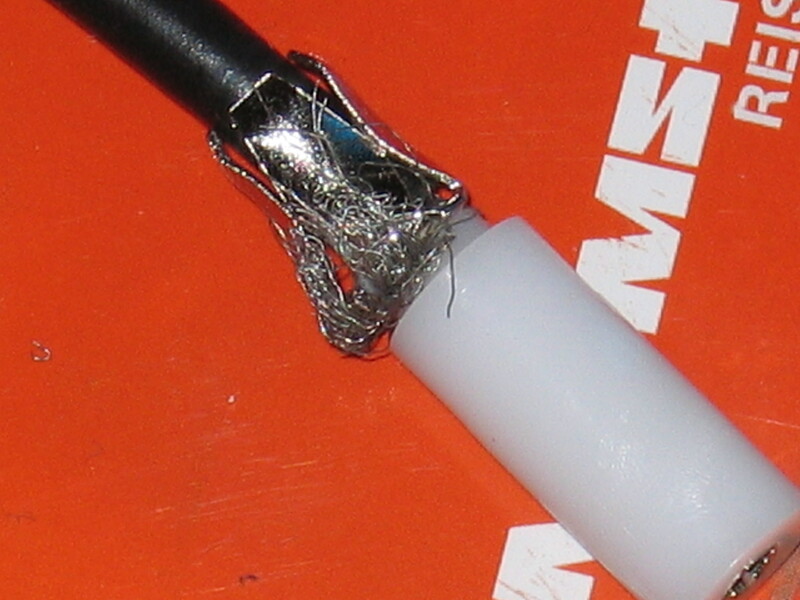 10) Using either fast-setting epoxy glue or a hot-glue gun, apply a fair amount of glue to fix the cable against the can and seal the connection. Glue seal (Note in this picture I have put on too much glue near the screw post hole which caused problems later during mechanical construction - don't overdo it). Ensure that the cable remains perpendicular to the board and flat against the can of the tuner module. 11) Insert the tuner board into the case taking care to slowly feed the cable play back through at the same time and not pinch it betwen the board and case side. This is a bit difficult to do easily since the original kit did not have the moulded on socket connector: you are forced to insert the board at an angle with the cable already through the case hole - it's quite difficult. Take care and do it slowly. I find I have to use reasonable force to push the board in, but be careful - again - that you don't overdo it and damage the case, can or board. Try to end up with a loop of cable a few centimetres long above the board to play with. 12) With the board in place, insert the screwposts and washers, and screw them down finger tight. 13) Feed the loose loop of coax slowly back out of the box until you have about 40mm of cable between the board and the side of the box. 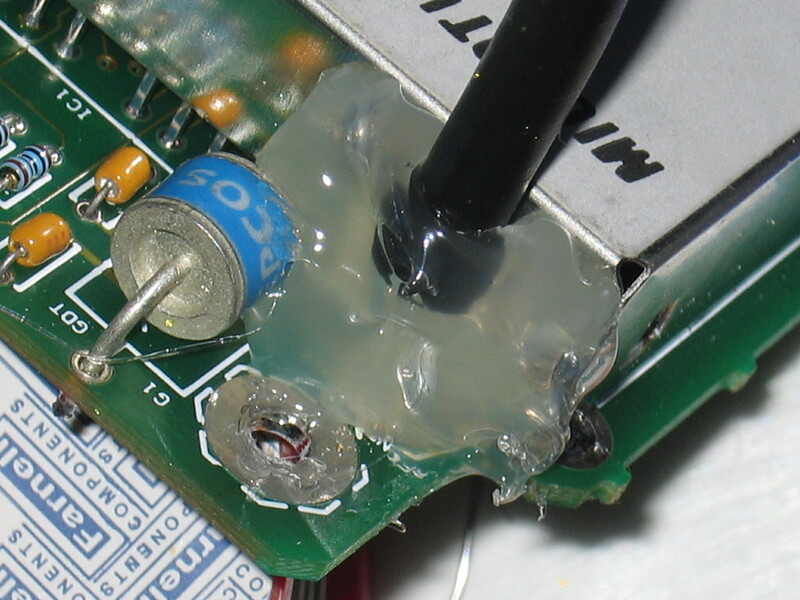 Be careful not to disturb the cable-locating glue on the board. 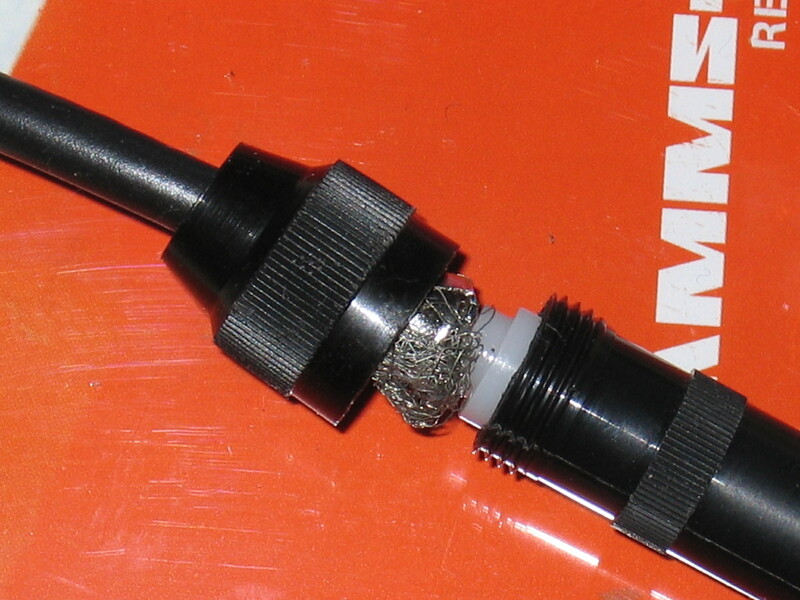 15) If you have the kit with the non-integral socket, strip the coax at the other end per instructions. However, do not roll back the shield braid. 19) Make continuity checks with a multimeter to ensure that the signal conductor is not shorted to the earth shield, and vice versa. If there is a short, investigate the cause and rectify before proceeding. 21) Unfortunately, there is no simple way to test the unit before getting to this point other than the constructional checks specified in the kit instructions. 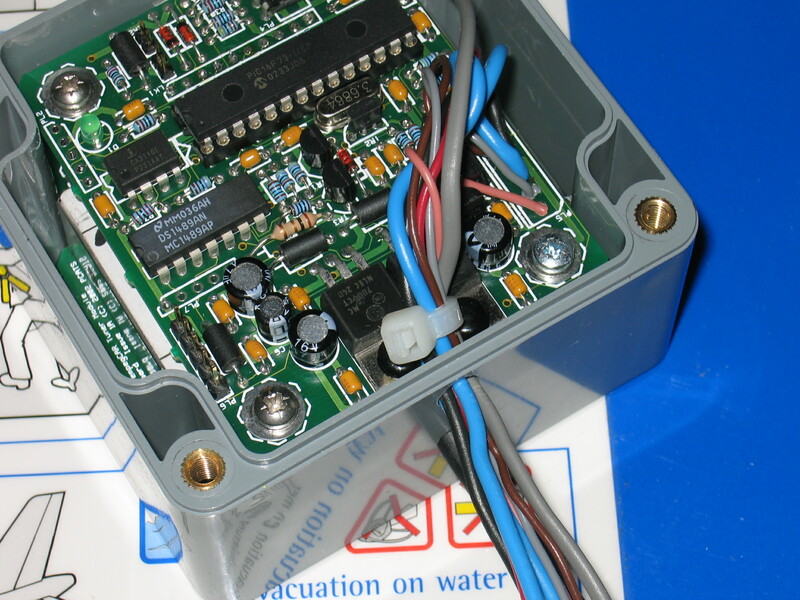 At this point, without fitting the lid, you should connect up the unit to the antenna and harness and try a functional check. If all is well, the green LED should light and you will get a good signal from the unit. If it doesn't, then unforch - you will have to simply go back and check the above sequence. This either works, or it doesn't - there isn't really a halfway house. If you have any questions about this mod or how to go about it, drop me a PM and I'll be glad to help. Wow...that was comprehensive. Maybe it should be added to the FAQ. It was, moments after it was posted. 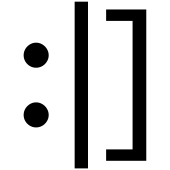 Anyone know where I can download tfabris and whether it is open source or not? Great pictures, that must be a nice camera you have. Brilliant guide, i re-did my tuner aerial connection when patrick supplied the sealed aerial cables. What I ended up doing is pretty much what you've recommended and found the performance increase to be quite marked. Naw, you don't want it. It gets the job done, sure, but it's not very user-friendly. Plus it runs under Windows. I got the impression that it rebooted, on average, once a day. Never seems to be down for long, though. I don't know. The reboot seems to take seven or eight hours. The reboot seems to take seven or eight hours. Didn't last night. Man, am I sleepy today. Still other people have the same problem? In general everything is ok but the signal meter is way to high. And you're absolutely certain that the wires going to the sled docking connector are assembled in the correct order? Rather than all of that hot-melt glue for securing the coax inside the box, I simply loop it (coax) around the screwpost. It's a very tight fit, and imobilizes things quite well in an easily reversible fashion. I also now ignore the pre-drilled hole for the signal cables -- cover it with tape -- and drill a new hole through where the two halves of the box join. This makes it really easy to insert/remove the electronics, with less stress on the wiring. I still haven't had any success with my signal quality level displayed. I wonder if the tuner signal level can be affected by the way the antenna wire is soldered on in the begging of this thread? Tuner shows full strength and reception of the FM station is pretty decent, but RDS light never stays on for more than 2 seconds - sound quality seems to fade in and out of "stereo"
Tuner shows 3 bars on FM stations with absolutly no recetion at all - all static. Tuner shows full strength on AM on every frequency regardless of actual signal presence (very bad reception on any AM station). You probably have an active antenna that needs a power supply. How does one determine if the antenna is active or passive? I installed a (Eutronix-built) PCATS tuner in my Wife's 2003 Buick Century and am experiencing the opposite of what you mentioned; Great FM reception but terrible AM reception. The only thing mentioned in the vehicle wiring diagram was "antenna trigger".